Many other airlines have cabinets/closets available for special usage, like wedding gowns; they operate on a first-come, first-reserved system, so email them sooner rather than later to make sure your pieces can be stored there. Ask how large the space is; your items may still need to be folded to fit. If none of those choices are the perfect fit (pun hugely intended), there are alternatives. Pay more for guarantees. Buy a seat for your gown, or upgrade to Saga Class/First Class for a promise that space will be available in the cabinet or closet. Ship your gown. Leave plenty of time for transport and customs. Ultimately, we ended up happy we chose to purchase pieces that travelled well when we decided to simply carry-on or check them. Having materials that were lightweight, foldable, easily steamed back to perfection were key, as was boarding as soon as possible to make sure there was room overhead. Because our wedding was in October, a chilly time of year in Iceland, and my dress was lightweight, I also tucked a faux fur jacket into the garment bag. My BHLDN dress and coat were placed neatly in an overhead compartment near our seats (I didn't want to let that baby out of sight!) and and his Bonobo's Jetsetter suit folded into our single piece of checked luggage. Wouldn't change a thing. We bribed a friend to carry a hand steamer to the venue, but Hotel Budir has two large steamers available for guest use. Handy to note! Calling it magnificent just doesn't do it justice. Watch it once. Then watch it again. There is something new and beautiful every time; we know we're biased, but really. We are forever grateful to our insanely talented videographers, Remi & Pui-Yuk, for their vision and dedication to capturing our celebration perfectly. They know their stuff and are the kindest, most tireless and brimming-with-ideas couple you could ever hope to meet. Added bonus: if you check the video out out, you can seeing what the fall in Iceland looks like! There was far more color than we anticipated, the yellows of Colorado aspens speckled with the reds of a Northeast autumn and the vivid green mosses characteristic of Iceland, all blended together and compressed down to a miniature scale, miles and miles of bright three inch high shrubbery covering the ground. 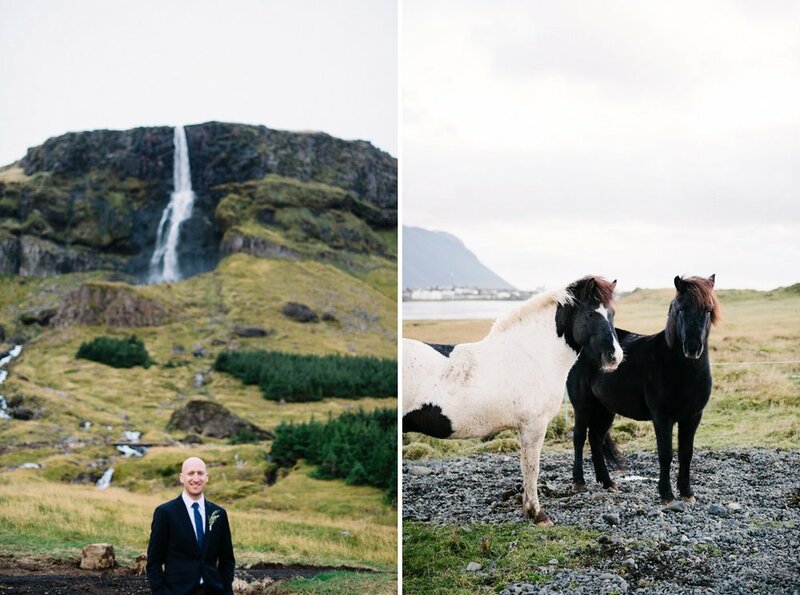 We WILL be returning to Iceland as a photo-and-video wedding team with these two. Inquire here. The one thing that, more than anything else, made our wedding as close to perfection as you're gonna find in this wonderful world, was the absolutely wild, majestic, untouched backdrop that is Budir. It didn't hurt, sure, that the weather was better than we could have dreamed in October, but even if the torrential rain the previous day had continued to rush from the skies indefinitely, it still would be the spot we would choose again and again. There is something about this place that makes a person feel very much alive, filled to the very brim with contentment, wide-eyed at the raw beauty that still exists in the world. It is expansive. Breathtaking. Panoramic. It makes you feel all the feels you'd hope to experience as you marry your love. Stand on the black sand beach overlooking the sea, turn 360 degrees, turn again, and you can't see a single thing that's been made by man aside from the white walls that make up Hotel Budir and the little black tar church nearby to the west. (The road leading there is hidden by hills.) It's exquisitely unmarred, vast. As though you'd been plunked down from the skies into a newly discovered planet that looks kind of like earth...but maybe a tiny bit better. Situated to the south of the hotel is a branching, churning estuary; wide to narrow and wide again, the water is blue and grey and cold and filled year-round with harbor seals. They are darling. To the north, walking straight up from the black sandy beach, are the lava fields. The rocks rip from the earth jaggedly; you don't know quite how deeply the crevices reach or how massive the rising rocks are until you're suddenly in the middle of them and think, wow. Just wow. In all of Iceland, we saw many lava fields. These were our favorite, the most expansive, covered in spongy neon moss and covered in the tall fellow grasses that mislead you into thinking that the mounds and rolls are solid earth. In the distance, the Snaefellsjokull glacier looms. If it's rained recently, which it will have, one million (numbers are approximate) waterfalls freefall and overflow from the top of the mountains. If you're looking for an incredibly remote spot as magical as any Iceland has to offer, but less than two hours northwest of Reykjavik, you've found our winner. Hold your horses, because this is just the start of their adventure together. More soon.